As promised, here are the remaining details of my trip. In a very condensed format. In my last post I told you about my trip to Bangalore where I met Gaurang and Kartik but I forgot to tell you about the trip I made with my family to my Paternal grandparent’s place a couple of days before that. Me, mom, papa and Surabhi all drove to their place for a day and had a great time there. Here’s a family pic taken at that time. 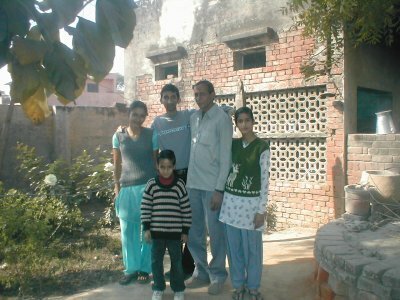 After I got back from my Banglore trip me and mom went to visit my maternal grandparents and my cousin. Mom drove the whole way (4 hours) since we were in a hurry (She had to attend some political meeting) and according to her she could drive better on those roads (I agree) so I slept the whole way. 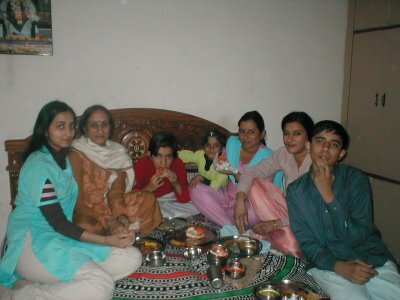 Once we got there mom and babaji (Thats what I call my grandfather) went to the meeting and I stayed at home with Mamiji (Mom’s brother’s wife), Ashok Bhaiya (My cousin), Sarika Bhabhi (His wife) and Shaurya (My nephew). I had a lot of fun with them. Shaurya took me to the fields and there we had guava picked fresh from the trees (I tried a couple of times but got unripe ones each time, guess I am not much of a farmer). Ashok bhaiya took me to the market and to meet his friends. It was a lot of fun, then we came back and had awesome home made food. 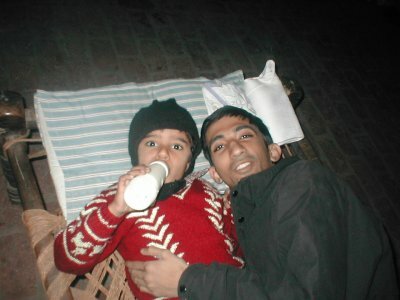 Below is a pic of me and shaurya taken when he was having his dinner. Then after luch we drove back and arrived in Delhi in the evening.